HelpSite offers a variety of options for setting up your knowledge base site (or multiple sites). For example, a site can be setup as public, requiring a shared password, or requiring each visitor to be logged in with their own email address and password. You can learn more about our privacy/visibility options for your help site. In addition to our site-level permission options, we also offer article-level permission options so you have control over which articles are visible to which users. Then you also have the option to make it so that specific articles are hidden, except to logged-in/invited users. By default, your articles will be set to "public", meaning just that they are visible to anyone who can see your help site (which may already be protected by a shared password or secret link). However this additional article-level setting allows you to define specific articles that will only be visible to users you have invited to setup their own email address and password. If you already have your entire Site set to "Visible to invited users only", where every user must have their own HelpSite accounts already, then the following article-level setting does not apply, since all of the options would have the same effect. This article-level visibility feature requires our Gold plan or higher. Public: This article is viewable to anyone who has access to the help site. (Depending on your site-level privacy settings, that could mean anyone on the internet, or only people with a shared password or secret link). Internal: This article is only visible to logged-in users. 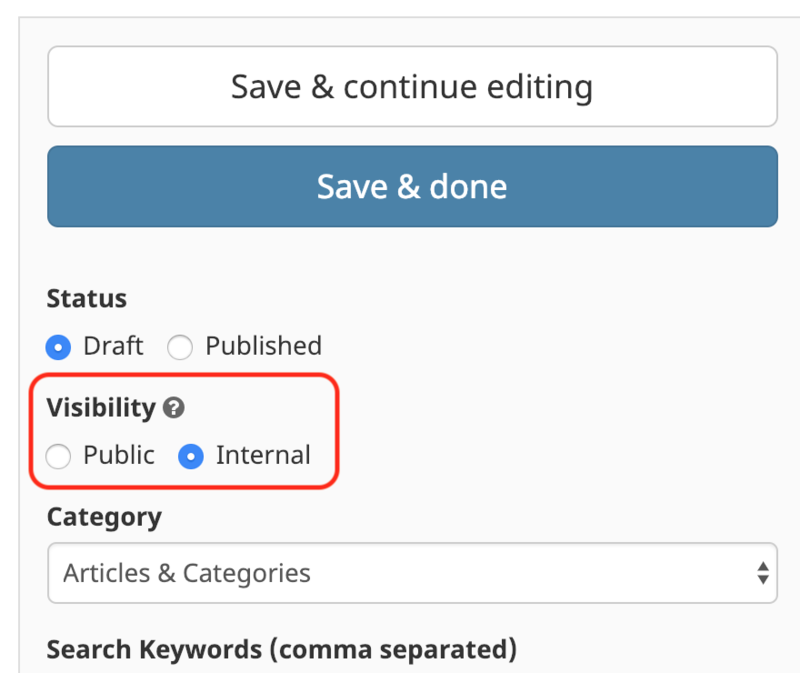 Your article visibility settings will affect which articles show up on your site's home page, category page for that article, the article page itself (will 404 for anonymous users), as well as search results. I would like one knowledge base that allows us to publish information for our customers, but also the ability to keep certain articles private, but not in a separate KB. So internally we can search one database for everything (publicly visible articles and the internal only ones) whereas external users only see the articles we want them to. The setting described above allows you to effectively have two "visibility levels" of articles combined into a single site. a single searchable site where most articles are visible to the public internet, but some articles are only visible to logged-in employees. a single site that some users access via a shared password or secret link from your intranet, but where you want logged-in managers to view additional articles. Using this setting along with multiple sites, would allow you to have up to three "visibility levels" of articles. another site that requires a secret link or shared password for a second type of articles together with a third (even more restricted) set of articles only visible to users who have their own individual logins. To learn more about the roles each invited user could have, see here. Note: HelpSite does not yet offer more fine-grained permissions that would allow you to choose specific logged-in users that could access one set of articles, while having a different set of specific logged-in users able to access a different set of articles. User-level visibility options like this is a feature on our roadmap to build in the future. Please get in touch with us and describe your use case in more detail if you're interested in this feature and we can put you on the list for early access.